CHELSEA COUNTDOWN: The day Vic Crowe was stretchered off, scored at Stamford Bridge and kneed Terry Venables between the legs! How the Evening Telegraph reported Posh's 1965 FA Cup quarter final defeat at Stamford Bridge. In the 1964-65 season Posh made a club record run to the FA Cup quarter-finals. Division One outfit Chelsea were the opponents . . .
Peterborough United’s bid for FA Cup quarter-final glory at Stamford Bridge 52 years ago was over after just two minutes. Vic Crowe's consolation goal for Posh at Chelsea in 1965. A full house of just over 63,000 had packed in see the Third Division giant-killers try and topple a young Chelsea side. But in the second minute Posh captain Vic Crowe was stretchered off after making his first tackle of the game. There were no substitutes allowed in 1965. Crowe returned to hobble around on the wing and even scored the Posh goal two minutes before half-time. Unfortunately Chelsea were 4-0 up by then thanks to goals from Bobby Tambling (2)and others from John Hollins and Barry Bridges. It was 3-0 after 14 minutes. Bert Murray crosses the ball to John Hollins for Chelsea's fourth goal. 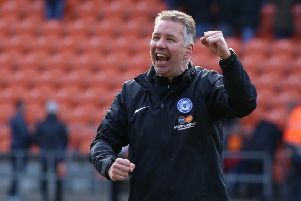 Bert Murray, who went on to help Posh win the Division Four title almost a decade later, completed the scoring in the final minute to end a club record Posh run in convincing fashion. Murray spoke to the Evening Telegraph about the game 35 years later, remarking: “Chelsea had an outstanding side in those days, but we were quite nervous about the facing Posh for superstitous reasons. “One of the famous fortune tellers of the time had predicted a lower division side would reach the final and we were facing the only one left! We walked out in front of an amazing crowd of 63,000, many more than our normal 40-45,000, and luckily we played really well. “We had top players like Terry Venables, George Graham and John Hollins, but we knew Posh had class acts like Peter McNamee, Derek Dougan and Ollie Conmy. Former Posh winger Peter McNamee pictured two years ago. “We were 4-0 up early on, but Posh never gave in and impressed us with their football. “We were just too quick for them, a point Dougan made after the game. “I was lucky enough to score the last goal, but we lost to Liverpool in the semi-finals. “My days at Chelsea were great thought. I had eight excellent years for the club having played with Venables for England schoolboys. “I enjoyed my time at Posh as well. I timed my arrival well the club had put together a good side and we got on well together. Posh winger McNamee added: “We travelled up to Blackpool to prepare for the game away from all the fuss, but we were outclassed on the day. Our goalkeeper Willie Duff, who had been brilliant all season, let a couple of goals in through his legs. “We weren’t overawed or scared though as we fancied getting a draw, so we were all down a bit at the end. “It had been a magnificent run though. We were proud of what we achieved. “It could have been so much better though. We had 25,000 Posh fans at the game. “Vic Crowe’s injury was a devastating blow, but he did deliver another great moment apart from his goal. “Terry Venables was showboating on the wing when Vic limped up to him and kneed him straight between the legs. “It was so funny and I just walked up to Venables and said you shouldn’t miss with hardman Vic even though he only had one working leg. Posh: Duff, Cooper, Crawford, Birks, Orr, Crowe, Barnes, Conmy, Dougan, Deakin, McNamee. Hollins, Mortimore, Boyce, Murray, Graham, Bridges, Venables, Tambling. Goals: Chelsea - Tambling (11 & 14), Hollins (12), Bridges (31), Murray (89). Posh - Crowe (43).